A reliable source for CPU Holder information and a resource for accessing leading CPU Holder and suppliers. A CPU holder is a workstation that is specifically designed for computers. CPU holders, or computer workbenches, are one of the most commonly used work stations. Used extensively in many settings, computer workstations are frequently used in offices, homes and on the shop floor to house delicate computer equipment safely, ergonomically and conveniently. CPU holders are workstation accessories which are often primary components of computer workstations, keeping valuable central processing units up off the floor, away from dust, dirt and damage and providing easy, ergonomic access to workers and technicians. 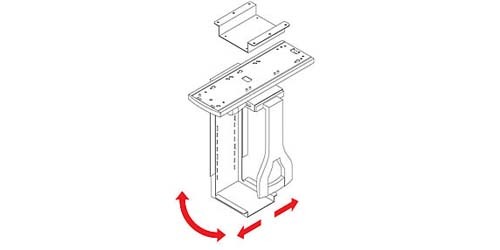 Desk attachment CPU hangers and under desk CPU holders have swivel brackets and slide rails which allow the unit to be rotated, pulled forward and pushed back out of the way. Other types of CPU holders include free-standing CPU mounts on wheels, desktop computer holders, CPU stands and PC carts. CPU Holder A CPU holder is a workstation that is specifically designed for computers. CPU holders, or computer workbenches, are one of the most commonly used work stations. IAC Industries offers a wide variety of laboratory and cleanroom work benches, seating, shelving, tables, and more. Our sole mission is to improve the organization, function and atmosphere of our customers` production and assembly work areas. Our workbenches come in a variety of styles including ergonomic height adjustable, chemical resistant, ball transfer surface, computer stations, laminar flow stations and more. As a workstation manufacturer, Pro-Line offers industrial furnishing that increases employee productivity through creating an improved employee work environment. BenchPro, Inc.™ manufactures complete line of America's finest workbench; everything from economy to premium designs for military, aerospace, cleanroom laboratory, universities, and electronic assembly. Our workbenches are suited for applications including: manufacturing, lab work, testing and more. These systems are designed for incredible strength and flexibility. Our units are easy to assemble and only require four simple tools. BOSTONtec is a multi-functional workstation supplier with easy product usage. 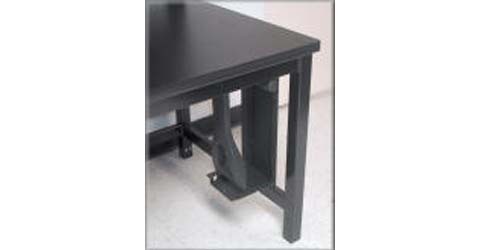 As workstation suppliers, BOSTONtec supplies durable and efficient workstations for many industries. CPU holders are utilized in a wide range of industries and applications. For instance, offices, schools, universities, warehouses, cleanrooms and manufacturing design departments use CPU holders for a variety of reasons pertaining to both worker and equipment safety. CPU Holder – RDM Industrial Products Inc. Instead of storing CPUs on the ground, on a desktop or on a cart without being properly secured, keeping CPUs within convenient reaching distance with under desk CPU hangers prevents stress-related injuries and may reduce time spent on maintenance. Elevating CPUs off the floor with CPU stands, carts, mounts and hangers also reduces risk of equipment damage by floor dirt, dust, bumping, spills or minor flooding. Not least among the benefits of using CPU holders is the efficient optimization of workspace; desktops free from bulky, immovable CPUs can allow for more organization, and therefore more productivity. CPU holders have a variety of design options, including storing the CPU in either a vertical or a horizontal position under the surface of a desk. Additional features include wheels or sliding tracks and retractable and swivel options. Also, dual CPU holders are available for the storage of two CPUs in one space.